One of the things I sell at my Etsy/Artfire shop are row counter bracelets, and while I’ve done well enough selling them to pay for a full year of hosting for Crochet Uncut, I also realize that not everyone can afford them. So, I thought to myself, why not do a tutorial on making them? This tutorial will show you how to make your own row counter bracelets. Add a chain and you’ve got a sweet necklace. You can even make a bracelet and necklace to match! 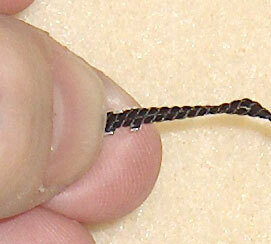 If you would like to make your own cord coils, see my tutorial: Make Your Own Cord Coils. You will need two 2″ eye pins and round-nose and chain-nose pliers. Rubber o-rings can be found at your local hardware store in the plumbing section. If not using the carded silk bead cord with the attached needle, make sure your bead cord is at least twice the length of the bracelet plus several inches to use for threading through the needle and making sure the beads don’t fall off the other end. For example, for a 7″ bracelet, you’ll need 14.25″ for the bracelet plus 3-4″ minimum for threading through the needle and room at the end. 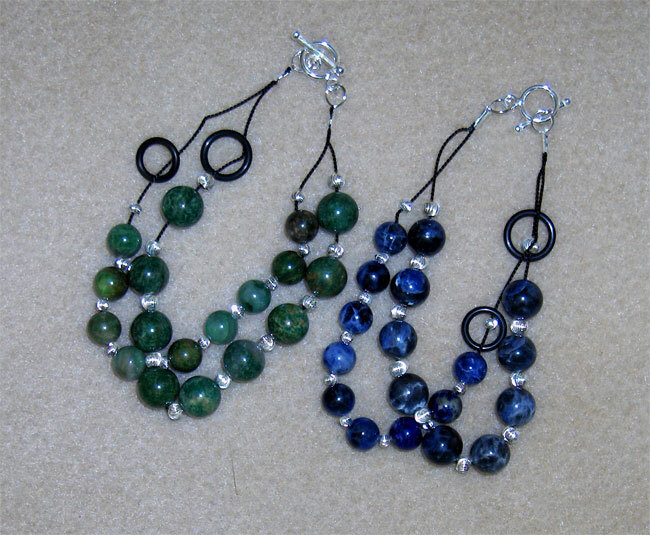 If using beads instead of gemstones, make sure the beads are sturdy enough to handle continual use with the o-ring passing over them again and again. Stay away from glass beads with bumps as they may weaken over time with the constant movement of the o-ring over them. Griffin Carded Bead Cord, Natural Silk, No. 6, 0.70 mm – the needle is attached to the cord so you don’t have to worry about purchasing special needles or threading it or losing it. 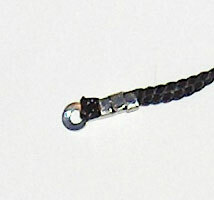 Fire Mountain Gems, Cord end, silver-plated brass, 7×2 mm – your local bead store may have these as individual pieces. Assuming you are using 0.70 mm bead cord, larger cords will require larger cord ends. 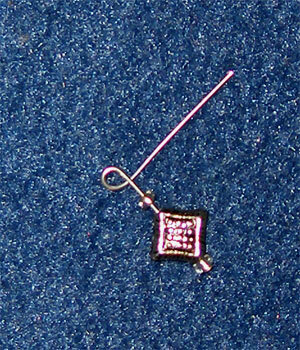 The charm dangle is used to mark where you start each row set. If you do not want a charm dangle, skip to the next section. If you are using a charm that has an attached ring, skip to the next section as well. Step 1 Thread one of the seed beads on to the head pin, then the charm/bead, then the second seed bead. 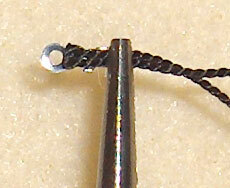 Step 2 Place the round-nose pliers about 3/16″ above the top seed bead. With your fingers or the flat-nosed pliers, wrap the wire of the head pin around the top of the pliers and down the side as shown below. Continue wrapping the end of the wire over the straight section of wire and around the back until there is only a small section of wire left. use the chain-nose pliers to press the end down so that it will not catch on yarn or clothing. Your charm dangle is now complete. Set it aside until needed to finish the bracelet. Step 1 Begin stringing the beads starting with a small divider bead, then a 10 mm stone, small bead, 10 mm stone, etc., until you have nine stones and 10 beads on the cord. A small bead should be at both ends. Step 2 String another small bead so that there are two next to each other, then add an 8 mm stone, small bead, 8 mm stone, etc., until you have nine 8 mm stones and 10 beads with a small bead at the very end. Step 3 If using the carded bead cord, move the beads all the way to the end of the cord, completely unwrapping the cord from the card in order to do so. You want to leave the rest of the cord with the needle still attached for your next bracelet. Step 5 Slip the o-rings over the ends of the cord making sure that the larger o-ring is next to the 10 mm stones and the smaller o-ring is next to the 8 mm stones. (Skip this step if using cord ends) If using cord coil connectors, place a drop or two of glue inside the coil, hold the cut ends of the cord together, and push them at least 0.25″ inside the coil. Hold in place for about five seconds then place it gently down on your worksurface. Allow to dry completely before continuing. If using cord end connectors, hold the cut edges together and place into a connector between the tabs. Make sure that the end of the cords are slightly higher than the top tab. Hold the ends tightly against the connector between two fingers. Step 8 Using the chain-nose pliers, fold the bottom tab of the connector over both cords. Press tightly on the pliers to ensure it is tight against the cords. 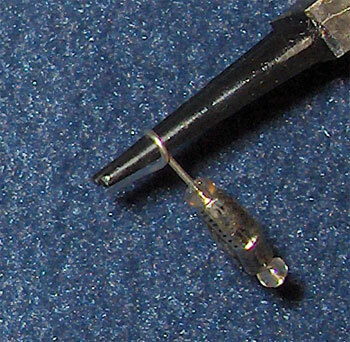 Place a drop of glue on the end of the cord making sure the glue covers the entire cord above the bottom tab. Wait a few seconds then, with the chain-nose pliers, fold the remaining two tabs down tightly over the cord. Make sure to keep your fingers away from the wet glue. If needed, hold the end of the connector with the flat-nose or the bent-nose pliers. Once the glue is dry, you can safely trim any cord ends that will interfere with placing the split rings through the connector opening. Step 11 Fold the bracelet in half and move the 10 mm stones to one side and the 8 mm stones to the other. Make sure that each side has a small bead at the end. Do not cut the cord as leaving it intact will make it easier to place inside the connector and will also keep the cord stronger. (Skip this step if using cord ends) If using cord coil connectors, place a drop or two of glue inside the coil, pinch the looped end of the cord together, and push it at least 0.25″ inside the coil. Hold in place for about five seconds then place it gently down on your worksurface. Allow to dry completely before continuing. Step 13 If using cord end connectors, pinch the looped end of the cord together and place it into the second connector following steps 7 through 10. Allow glue to dry completely before continuing. Using the bent-nose and chain-nose pliers, open one of the jump or split rings. Continue holding the ring with one of the pliers and thread the ring openings of the bracelet connector (the one nearest the o-rings), the charm dangle, and the round section of the toggle clasp or the lobster clasp, depending on which type of clasp you are using. Use the two pliers to close the split ring making sure the opening is as small as possible especially if using the cord ends as the ring is very thin. 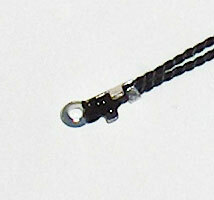 If using a toggle clasp, repeat step 14 on the other end of bracelet to attach toggle section of clasp only. If using a lobster clasp, only attach the other end of the bracelet to the split ring. The lobster clasp will attach to the split ring to close the bracelet. 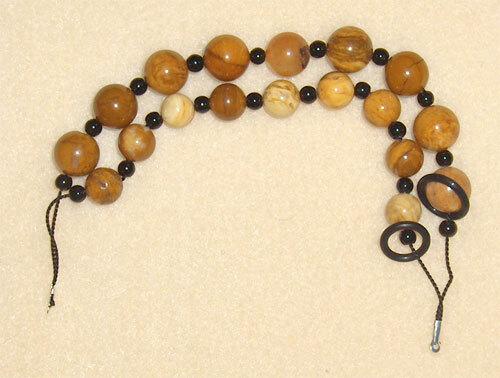 When making the bracelet section, after folding the cord in half (see step 11), cut the cord making sure that the cord for the large stone side is longer than the small stone side. Purchase a chain with links big enough to use with the split rings. Fold the chain in half with the connectors at one end and cut the chain in half at the looped end. 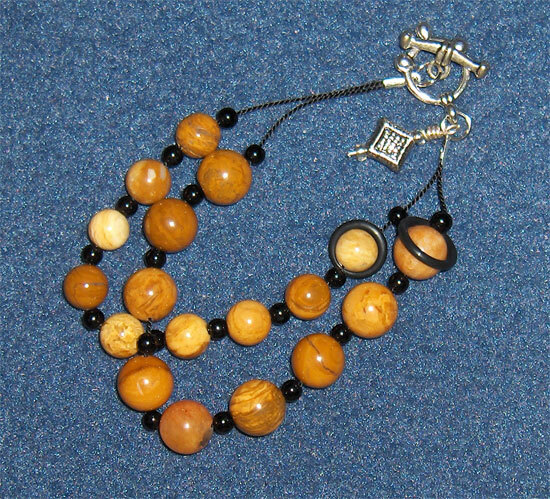 Attach the cut ends of the chain with the connectors on the bracelet with a split ring making sure that the large stones are under the small stones. When attaching the chain to the end by the o-rings, add the charm dangle at the same time. Row Counter Bracelets can be used to count up to 99 rows of crochet or knitting. It can also be used to count rows for weaving and calories consumed. 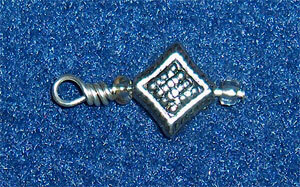 The charm dangle indicates the beginning of a row. The small stones (8 mm) indicate one row each. The large stones (10 mm) indicate the tenth row completed. Before beginning your project, make sure both o-rings are at the end of the bracelet next to the charm dangle. Crochet or knit your first row. 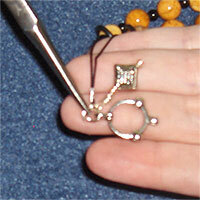 At the end of the row, move the small o-ring over the first small stone (ignore the smaller beads). This indicates that you have completed one row. Continue working and as you complete each row, move the o-ring over another small bead. 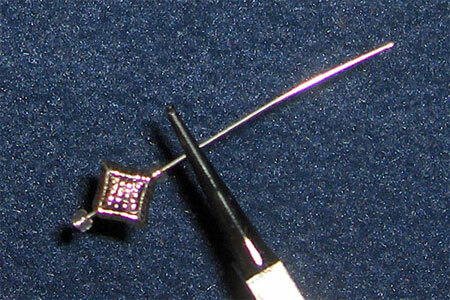 After completing row 10, move the small o-ring back to the beginning by the charm dangle and the large o-ring over the first large stone to indicate 10 rows completed. After the next row, move the small o-ring over the first small stone and continue as before until another nine rows are completed. At the end of row 19, move the small o-ring back to the beginning and the large o-ring over the second large stone. This indicates 20 rows completed. Once you’ve completed 99 rows, both o-rings will be past the ninth stones. Move both o-rings back to the beginning by the charm dangle and continue. Variation: If you don’t like moving the o-rings back to the beginning at the end of every 10th row, leave it at the end and move it back towards the beginning for the second set. You’ll need to remember which direction you are heading in in order to not lose count. For example, if the large o-ring is after an even numbered stone or next to the charm, then you are moving from the beginning of the bracelet towards the end on the smaller stones. If the large o-ring is after an odd numbered stone, then you are moving from the end of the bracelet towards the charm on the smaller stones. You are more than welcome to sell or give away any bracelets or necklaces you make using this tutorial. Just make up your own usage instructions to include with them (or point them to this tutorial).